When we build Greenway, we will activate the entire corridor transforming decaying rail infrastructure into a positive community asset. Building on the existing graded rail bed is the most cost-effective way to create level pathways for people with various fitness and ability levels. 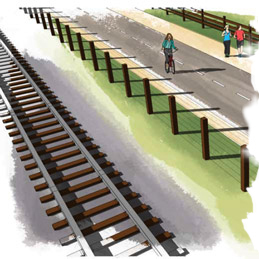 Greenway will cross existing trestles so that users encounter cars only at occasional street crossings. Trail design and amenities will be optimized based on the width and projected use of each section. In the highest use areas, physical barriers will separate fast moving cyclists from slower foot traffic ensuring a safe and pleasant experience for all users. Building Greenway and investing in transit solutions closer to Cabrillo College, the hospitals and other employment centers will improve quality of life for everyone who commutes in Santa Cruz County. We are happy to see these options included in the RTC’s Unified Corridor Study. The RTC’s current plan would be much more costly to implement. It proposes major infrastructure building in our protected coastal zone to leave the tracks in place for a train that will probably never be funded. The result would be a narrow mixed-use path that will likely detour users onto crowded streets in many places. Extensive fencing to keep users off of the adjacent tracks would also make accessing and crossing the path difficult. When we build Greenway, users will enjoy the welcome shade provided by this canopy near New Brighton State Park. Keeping the tracks in place here would likely mean cutting down many large trees, excavating the hillside and building a retaining wall to make room for a trail. The people of Capitola are afraid that a train might fall into the Village if Iowa Pacific runs another holiday train this winter. They do not want trains crossing their historic trestle. A majority of people who participated in the May 2016 Vision Capitola: Creating Community survey said that a trail-only solution would be the best plan for their community. 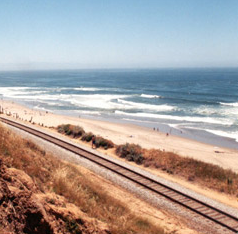 2012—Santa Cruz County Regional Transportation Commission (SCCRTC) purchases the rail corridor using $11M in California Proposition 116 funds and Iowa Pacific signs freight and tourism contract. 2013—The Monterey Bay Sanctuary Scenic Trail Master Plan (MBSST) estimates $127M to install a trail next to the existing tracks. 2015—SCCRTC Rail Feasibility Study forecasts low ridership for up to 60 trains per day—resulting in noise, pollution, and harm to the environment and says 90% of current steel rails and ties will need to be replaced. The capital cost of the train and the annual operating subsidies for 30 years equal $700M. The RTC has none of this money now. The California Transportation Commission (CTC) says Proposition 116 funds can be returned if we do not want a train. 2016—Great Santa Cruz Trail Study hires Nelson Nygaard to study a trail-only option. Based on this study, trail-only construction is estimated to cost about $70M. Measure D passes allocating $85M for a trail in the corridor. 2017—Further analysis of MBSST plans on the Westside and the North Coast, and safety concerns about Capitola and other trestles confirm fears that the MBSST plan is unrealistic. “Railbanking, as defined by the National Trails System Act, 16 USC 1247 (d), is a voluntary agreement between a railroad company and a trail agency to use an out-of-service rail corridor as a trail until a railroad might need the corridor again for rail service. Because a railbanked corridor is not considered abandoned, it can be sold, leased or donated to a trail manager without reverting to adjacent landowners. Railbanking takes place during the rail corridor abandonment process. Official negotiations with the railroad begin after the railroad submits an initial notification to abandon the line to the Surface Transportation Board (STB). Negotiations end with either railbanking or line abandonment. What if “Bike to Work Day” was everyday? Philadelphia Mayor Michael Nutter leads a group on Bike to Work Day 2013.